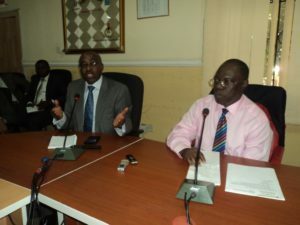 The Anti-Corruption Academy of Nigeria (ACAN), a training institute of the Independent Corrupt Practices and Other Related Offences Commission (ICPC) is working towards training health workers on good governance, accountability, transparency, integrity, ethics and building a body of knowledge that will facilitate the development of knowledge-based anti-corruption policies in Nigeria. The Provost of the Academy, Prof. Sola Akinrinade, made this known in a paper he presented to the Board of the National Agency for the Control of Aids (NACA) during a courtesy visit to the agency’s headquarters in Abuja recently. Prof Akinrinade stated that the establishment of the Academy was in tandem with the provision at Section 6 of the Corrupt Practices and Other Related Offences Act 2000 which empowers the Commission to carry out certain preventive, enforcement and enlightenment functions. He added that the Academy’s mission is to be a centre of excellence, enhancing a multi-disciplinary approach to the fight against corruption through Training, Research, Documentation and Advisory Services. Against this backdrop, the Provost revealed that the visit was designed to develop a partnership with NACA and formulate a programme aimed at building capacity in the sector. According to him, the health sector has not been spared the challenges confronting the country, saying that over the years the budgetary allocation to the health sector has not produced the required output. He further said that the programme would help build integrity and transparency in the health sector by bringing together professionals in the healthcare sector to address critical issues and to x-ray loopholes for corruption and corrupt practices. The intended programme is expected to have target participants of one thousand (1000), with membership cutting across members of health and appropriation committees of the National Assembly, Federal Ministry of Health , Ministries of Health in the State and FCT, critical intervention agencies and programmes including NACA, Rollback Malaria, Polio and Guinea Worm Eradication etc. The Director General, NACA, Prof John Idoko commended the Academy for initiating the idea, saying “ the problem with corruption has to do with our orientation”. He said the framework for the control of HIV prevention can be adopted for the fight against corruption. He hopes to work with the Academy in achieving success in the fight against corruption. I got to know about Anti-corruption Academy of Nigeria on an NTA news programme this night and what I heard from the Provost, in the person of Prof. Akinrinade intrigued me a lot. And as a young academic staff of a university who detests all forms corrupt practices in the university system, I am really interested in being a member of the team in this anti corruption crusade in the higher institution. My heart bleeds whenever I see or perceive any form of corruption in a system especially the university where there is supposed to be high level of excellence, integrity and sustenance of moral standard. Not the moral decadence, unnecessary politics and bigotry that are the order of the day, hence degrading the quality of the products of the system. This is very pathetic and requires much urgent attention. I wish to be part of this team. 08036966374.